iPad owners might soon have a new, more compact option when choosing a keyboard to pair with their tablet as Apple is contemplating a redesigned iPad Smart Case with an integrated, multitouch keyboard. Apple revealed the invention in a patent application uncovered by AppleInsider and entitled "Cover for electronic device." The proposed case appears to be a combination of the company's existing Smart Case and Smart Cover, with the addition of a thin touch-sensitive keyboard. Unlike similar products, Apple's design does not use the keyboard to form part of the exterior of the case. Instead, the keyboard is a separate piece that can be detached while still allowing the iPad to be fully ensconced in the case. While the current Smart Case and Smart Cover use magnets to stay in position, Apple envisions several other options for the new design. Buttons, snaps, buckles, Velcro, and "other types of mechanical enclosures" are among the options mentioned. 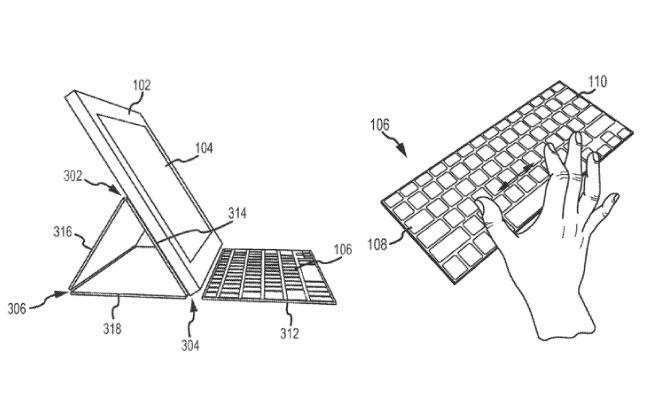 According to Apple, the keyboard could connect to the iPad either wirelessly or via a physical plug. Most third-party iPad keyboards today connect via Bluetooth, as does Apple's own popular aluminum wireless keyboard. Apple credits John G. Elias with the invention of U.S. Patent Application No. 13/624868.